We describe microgravity generation and the resolution evaluation results of a sub-1-mG microelectromechanical system (MEMS) accelerometer (1 G = 9.8 m/s2). To realize input acceleration below 1 mG, we show the principle of generating microgravity acceleration by adjusting the tilt angle. 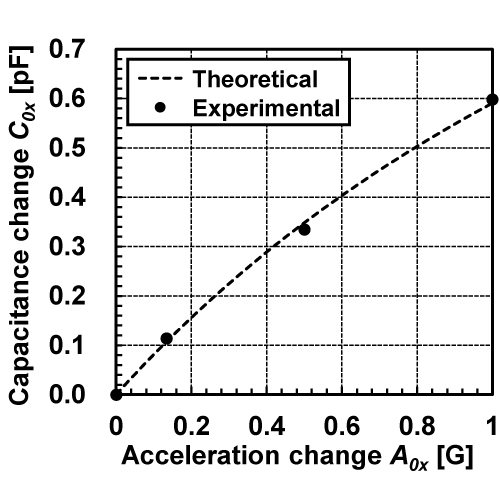 The change in acceleration induced by a tilting board is quantitatively analyzed, and the capacitance change of the MEMS accelerometer as a function of tilt angle is measured. The analytical results show that the tilting board has the potential to generate microgravity. The experimental results reveal that the sub-1-mG MEMS accelerometer can realize the detection of sub-1-mG-level acceleration. Motohiro Takayasu, Ippei Tsuji, Hiroyuki Ito, Daisuke Yamane, Shiro Dosho, Toshifumi Konishi, Noboru Ishihara, Katsuyuki Machida, and Kazuya Masu, Microgravity Generation Using Tilting Board for Resolution Evaluation of MEMS Accelerometer, Sens. Mater., Vol. 30, No. 12, 2018, p. 2919-2926.